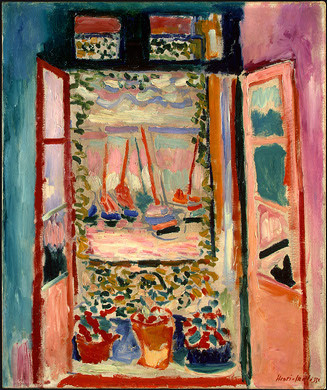 This led to my looking at 2 other Matisse window paintings (below), which then reminded me of my favorite window painting, Marc Chagall’s Paris Through the Window, which then reminded me about the inspirational talk we had last December in the art room. The discussion started on break in between classes while a few students were looking at the floating images within this asymmetrical piece. The students already knew the basics about Paris Through the Window, and so I just began sharing some of the few tidbits I knew about Chagall’s Russian Jewish background, like how this painting was made after he was living in Paris for three years, and how he probably missed certain parts of being home as this picture depicts his new life in Paris alongside of images of his former village life. 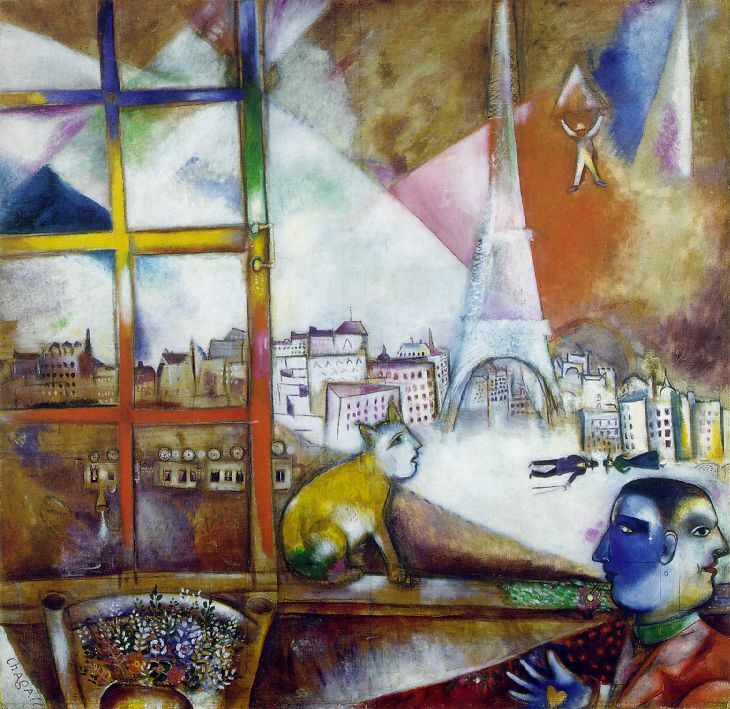 Paris Through the Window, Chagall, 1913. A Cubist style cityscape with Fauvist color and a surreal feel. Scholars agree that Chagall liked his time in Paris, especially because he said, “Paris is the color of freedom, the sun and the joy of living.” In the painting, notice the shine on the Eiffel Tower and the yellow, smiling face, which hints at joy with this newness. Now look at the more serious blue face, which is also accompanied by a blue hand with a heart right in the palm, which may be reflecting the heartfelt and embraced love that will always anchor him to his boyhood home. 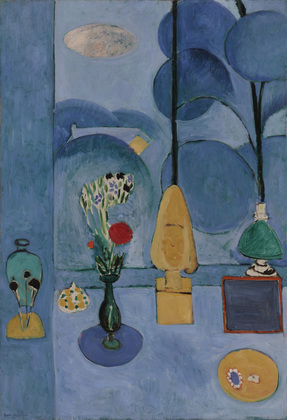 This painting could have allowed Chagall to cope with his transplant status by helping him to acknowledge – and then file – his feelings as he compared different places. 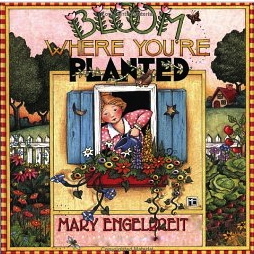 Our talk in the art room that day also reminded me about Mary Engelbreit’s Bloom where you’re planted piece (below)- and how the apostle Paul noted that he learned how to be content. “I know what it is to be in need, and I know what it is to have plenty. I have learned the secret of being content in any and every situation, whether well fed or hungry, whether living in plenty or in want.” Anyone can be happy when things are going super great, but it takes maturity and the grace of God to learn how to be content no matter where you are at. Broken windows is actually an old city revitalization theory that came out of the 1970’s in New Jersey, which addressed issues of urban decay. The theory was used to posit that small disorders will lead to bigger disorders, which can then lead to more crime. This theory is what Guiliani used to help clean up NYC in the 1990’s – and by not overlooking broken windows, graffiti, and small signs of breakdown, the city improved. SIMILARLY, in our lives, small, untended areas can lead to sloppy habits, which can then lead to more and more decay. In the counseling world, people are asked to take a serious look at any “untended” behaviors that may be clogging success. You may want to do that now, because many times the situation is NOT the problem, it is our VIEW of life that keeps tripping us. Sometimes it is unbridled “demandingness” – or expectations that are clashing with reality, or just selfishness. Now sure, sometimes a change is in order and relief may be needed and at that point we may need to feel and embrace that too – But quite often, the change needed is a personal one and it takes self-awareness to grow and find contentment! 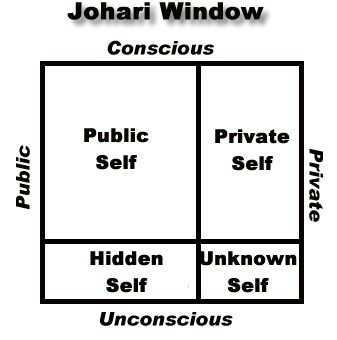 The Johari Window (1955) in psychology is actually a little grid that helps people RAISE SELF-AWARENESS! The window has four sections that categorize different areas of self: Public, Private, Blind, and Undiscovered. 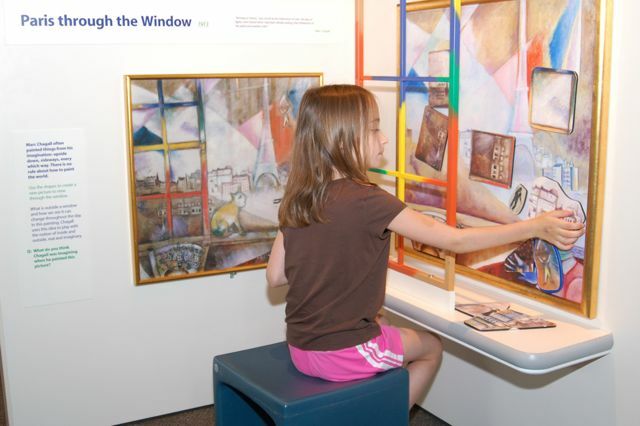 Taking the time to explore your window can be a powerful activity that helps you raise personal awareness (about who you are and how you come across to others). This is important because when you know more about your God created wiring, it can help you examine current and past responses to life. Better self-awareness can give you more of a feel for “why you do what you do” and highlight any behaviors you just can’t see! Sometimes people experience a lot of relief when they see the bigger picture of who they are – and they become more content- and get more solution focused – when they see things and when they understand how personality interplays with life. In closing, if the coming holidays are a big drag to you – I would like to challenge you to find a way to do the holidays with a bit more joy! I know for our family, it took some exhausting (and expensive) traveling nightmares to finally say that we just would NOT travel over the holidays any more! Drawing this boundary was a turning point for us, which then freed us up to make new traditions and to define what the Holidays meant to us! So do that now, be intentional and purposeful about finding contentment, because life is too short to not find general contentment. ~ Students will want to examine that this is an asymmetrical piece. Chagall also uses vivid color, depth, line, and shapes to develop unity. Have them note triangles in the Eiffel Tower, parachute and the shape the sky and in windowpanes – and note rectangles in the sky, window, each windowpane, train and buildings. ~ Hang up works of art that you study – or have copies around for quick reference, because it can lead to some enriching reflection. 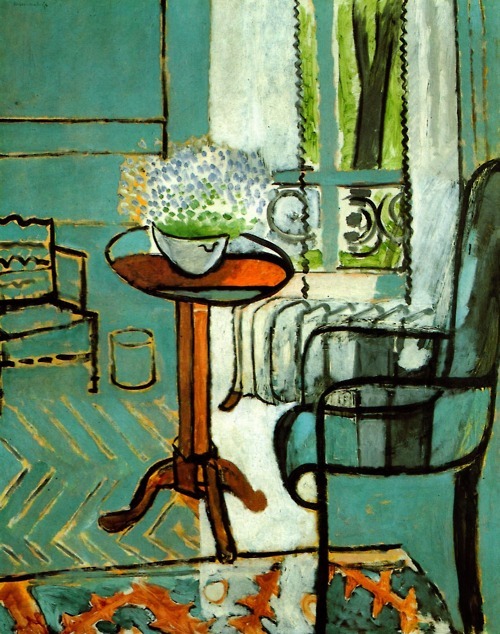 For example, because I kept a copy of this painting hanging up on the wall (where masterpieces used to go after lessons) this availability is what led to our special talk that December day. ~ Chagall’s paintings often have surreal objects and mini stories going on in different sections, and sometimes it is nice to just let students hypothesize and guess as they observe different works. Also, be sure to have students use the “elements of art” to do some easy art criticism. ~ Do not think that students are ever too young to talk about feelings and coping – always make sure it is age appropriate, but elementary students can grasp what it is like to ache, and can learn from talking about adapting to moving around, missing a place, or to have to deal with feelings of contentment and being in the now. ~ Remember, even if we like where we are, sometimes it is okay to still miss places we have been or lived! And maybe writing about feelings, or painting a reflective piece, it can be an activity that leads to more contentment in the now. December 7, 2013 at ..
December 10, 2013 at ..
Beautiful. Chagall is one of my favorites. December 11, 2013 at ..
December 13, 2013 at .. Thank you, Y, Waterhouse is an overwhelming favorite (I love that so many of his pieces are based on lore and literature), though Wyeth, Chagall, Picasso are favorites too.